Long ago, I received a copy of this book to review. And the email accompanying the book has been sitting in my email box ever since as a reminder that I need to write the review. It is the oldest email in my box. When the author was ten, her parents made the decision to leave the colony. As you can imagine, this was a major adjustment to the whole family. The family’s adjustment to life outside the colony is as interesting as the description of life inside the colony. I admit that I don’t remember all the details now, but I do remember admiring the writing and reading the book with rapt attention. 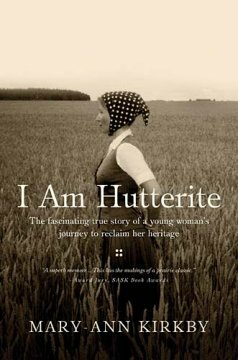 I learned so much–I had never even heard of the Hutterites before–and found the real-life story fascinating. I’ve long had an interest in the Amish–ever since I had an Amish midwife care for me during my first pregnancy and attend my birth. (I even went to the Amish midwife’s home for prenatal care and ate a meal there.) The Hutterites seem similar to the Amish, so the glimpse into their closed community was amazing. Anyway, so I liked the book and recommend it. You can purchase it from Amazon for only $8.00 at the moment! I’d loan you my copy but it’s long gone! We met some Hutterites in a department store in Winnipeg,the summer I spent there. (We were wearing conservative Mennonite garb at the time.) They invited us to visit their colony, in rural Manitoba. Their communal lifestyle was fascinating. Leaving it would probably be even more difficult than leaving the Amish; they were so interdependent, sharing main meals in a large cafeteria hall, no full kitchens in the family condos/apts. A few of the older women would go out and buy bolts of fabric and bring them back for the others to choose for their clothing. Life arranged by ringing bells, a certain number of rings would call young men to catch an escaped cow; a different number would call all the young women to the kitchen to assemble pies for the next meal. The life had its pluses and minuses. hope i can find it on barnes & noble! i have the Nook…which i love, love, love!! Sounds very interesting– I grew up in Alberta near some Hutterite colonies. We visited as a field trip a few times. A couple things I remember are my dad commenting on how the men always had the most up to date air conditioned farm equipment and the women still did so much work the old fashioned way. Also I had friends who used to meet up with the teenage boys who would sneak out and party!